So, when I looked at this book it had some mixed reviews, seems some loved it and others hated it – but I was intrigued by the description and decided to see for myself. I’m in the “loved it” category though I’m unsure if I’d re read it. At first it’s easy to just see Everly as this “poor little rich girl” in a sarky way, when we think with all that money she can’t possibly have problems. However though lack of money can and does very often bring problems and arguments, having unlimited funds doesn’t mean happiness, and Everly is the perfect example. She’s lost her beloved brother, and her parents care more about appearances than helping her. For them its not what she does that’s the problem, but that she’s seen doing it…then we learn more about her and it seems it’s not just since her brother died they’ve neglected her, and that she lost her virginity at just 13 to Hudson. He’s an odd guy, possessive and horribly destructive, he’s one of those accident waiting to happen people, with his alcohol and drug addiction, and his living life on the edge of danger without a thought. He drags Everly along with him. I’d dislike him, but then I don’t know what in his background made him like that – maybe he too suffered from lack of parental love and attention? Whatever, he’s no good to Everly, and she’s escaped to Paris after the last drama, where he got images of her going viral on the Net and her parents have closed her trust fund in disgust. She’s been pawning jewels and working at a cafe in Paris since – partying with the usual crown who hang on but aren’t friends, just in for the free loading experience. Its at one of these parties when she’s wondering if life is worth living, drunk and drugged, that she meets Beckett. He’s been brought by a friend. He’s got his own problems, suffering from PTSD, after a bad experience reporting from the Afghanistan. He’s on sick leave and desperate to get back to work, though he won’t recognise his problems. Something in Everly calls to him and they leave the party…. I loved Beckett, he sounds hard and yet he’s not, just struggling with his own demons from his background, his guilt at not being there when his beloved aunt died to the new ones from the kidnapping. 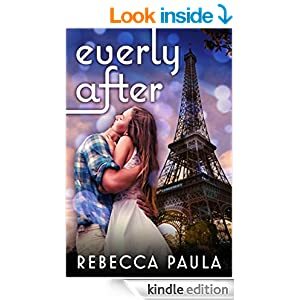 He can see Everly needs help too, and one side of him says she’s too much to handle that she’ll drag him down, but the other side of his can’t seem to leave her. I really liked his character, he tried so hard to help her, and I could see the sensual attraction that started with a jump at first meeting growing deeper into real Love. Things seem to be working for them, his book is going well, their relationship has moved forward, and Everly seems to be able to keep off the drink and drugs, and then….. Hudson finds her again, and she’s pulled back into a downward spiral by events beyond her control. Can Beckett get her back? Does he want to? What does she really want? Its a beautiful story, very cleverly written to show that these two are not damaged and broken but simply fragile and brittle. The slightest wrong thing could tip them into broken beyond repair, but somehow they find a strength in each other and can be each others salvation. We do for others what we won’t do for ourselves sometimes. Its a real bittersweet romance, full of drama and pathos, and yet with some incredible tender and beautiful moments too. I was rooting for them all the way, they need each other but had so many obstacles to overcome, it was clear it wasn’t going to be one of those where Love saves the day, but needed lots of hard work from them both too. Stars: Five, a wonderful, unusual read.